Just for fun | TGIM Work-Life! When was the last time you had a big belly laugh? You know the kind that gets you practically crying and aching in your belly, cheeks, etc. Ahhh, those are fun. Well, if you haven’t had one in a while, no worries, there’s help! No I’m not about to tell a joke – instead, I want to share a link to a fabulous person who can make you laugh. A friend of mine – Wendy Woods of Watershed Training Solutions — is a Laughter Yoga specialist (amongst other training talents). She is so good, she was recently profiled on Entertainment Tonight – you can see the video on her site. Give it a try. It’s good for you! New research from Harvard University and the University of California have just released a new study that confirms that happiness loves company — and can be spread around just like a virus. It’s in all the papers today. See here for one article from the Globe and Mail. According to the research, you can catch “happiness” from people you don’t even know and spread it around to others. Sometimes just a smile will do it. It can have a ripple effect on a social stratasphere. Given the doom’n’gloom of the economy these days – I think this is GREAT news. And can be deployed as a major TGIM strategy. Simply start to smile more and see what happens. You can make a difference. It also makes you wonder: are you hanging around the right people? Are you hanging with happy people? Are you the kind of person someone will want to hang out with too? It’s All About the People…. A client of mine (on the communications/PR side of my biz) recently retired from her role as VP Communications of the organization she’s worked with for the past 10 years. I’ve had the privilege of working with her these past 6 years (I provide communications counsel) and have come to know her quite well. In the days leading up to her farewell party – and at the party itself — I’d heard her reminisce about her career and repeatedly say: “It’s all about the people.” In her parting words, she counseled her younger staff to remember how important and valuable relationships are in one’s work-life – in many cases, even more important than the actual work! It’s easier to work hard at something when there is an underlying purpose or passion behind the effort. Sounds like an oxymoron doesn’t it (“easier to work hard“) but that’s how it goes. Well, nobody knows this better than Terry Fallis. 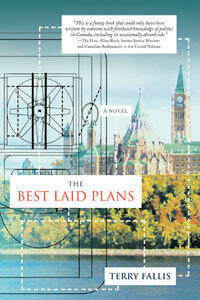 Terry became a first time novelist this past year — and his book, The Best Laid Plans, has just been named one of five shortlisted contenders for the Stephen Leacock Memorial Medal for Humour. Wow! How’s that for playing it big on your first try!? This is a huge accomplishment for Terry. Not only is this his first novel — but he did it while working full time. By day, Terry is president at Thornley Fallis – a very busy and successful PR and communications company in Toronto and Ottawa. By night, he’s doing hockey duty, family time and what not (husband, two kids, volunteer life, etc.). How the heck did he have time to write a top-notch book worthy of such a high profile award? Well, guess it was important enough because Terry made the time. At his book launch he explained how he wrote The Best Laid Plans before and after ‘after hours’ . Huh? Terry would wake up at the crack of dawn and get a few hours of writing in before work. Then at night, after work; after the hockey games; after the family stuff……Terry would settle into some writing time at 10/11pm…..I’m tired just thinking about it! What drives someone to do that and to pull off such amazing work at that? Terry said he always had a dream to write a book. And guess what?! He had no expectations about the outcome…he just simply wanted to write it. And he wrote and wrote…..from his heart and his passions. He drew the inspiration for the book plot and characters from his personal story and life experiences. LESSON #1: Great things can happen when one comes from the place of heart and passion. LESSON #2: Funny how one can “find” the time when they are clear and focused on a dream. LESSON #3: It’s easier to work hard when you are doing something you love. LESSON #4: Your life outside of your work is just as important to provide that ‘mojo’ factor in your life (TGIM….is for work AND life). LESSON #6: You don’t necessarily have to quit your job to do something you’ve always wanted to do. When you are committed – you might just find a way. LESSON #7: Our life stories and personal experiences are often the best place to start for inspiration (and I’m not just talking about writing books!). LESSON #8: I suspect there are more lessons here…..so am leaving this one open for comment…. By way of disclosure, I know Terry professionally and have read his fantastic book (I loved it!!!). I met Terry years ago when working at Hill and Knowlton and more recently have the pleasure of being in touch as I am blessed to be working with many of the great folks at Thornley Fallis in my current work-life. Social committees can serve many purposes. Certainly they can add some ‘joie de vivre’ at work (a sense of fun). And they can also help build a more engaged internal ‘community’; encourage teams and departments to work together; give people opportunities to stretch their skills outside of their particular job role — and more. HR Reporter interviewed me for an article on the topic. If you are interested, have a read. And as always, would love to hear your thoughts. Okay so I succumbed. I said I wouldn’t but I did. It’s only been a few days and I’m wondering how I ever lived without it. Am I addicted already? Blackberry, crackberry…so they call it. I have to say I really like the freedom of being in touch where ever I am without having to be near my computer (or beg/borrow another one while out). No more worries about the gazillions of emails piling up while I’m at meetings ….I can either handle as I go…or at least know what I need to handle when I’m back. Email overload….definitely an issue these days for folks (myself included) who are inundated with too much email. And when you’re out and about, it piles up. This in itself is a huge contributor to the stress and overwhelm of work-life. So in the spirit of the TGIM philosophy, I say anything one can do to manage that piece….well is worth a look, right? So I’ve been thinking…..before I get too deep into this obsessive attachment, maybe I should come up with some ‘rules’…..you know, like set some Blackberry boundaries. 1) I shall not check my Blackberry (BB) while driving (oops….already did…but it was at a light…Does that count?). 5) I shall not……………..s’cuse me for second….I’ll be right back…. …….uhhhh……sorry ’bout that…my BB just vibrated so it must’ve been a really, really important message and so I’m sure you understand I just had to get it……..now where was I? I can see this is going to be MUCH harder than I thought. Well, here’s a call to recovering Blackberry-aholics out there….if you have any tips and lessons learned from your own experience, send them along! You can post them here….or better yet, also email me……It’ll be quicker cuz I now have a Blackberry!!!! This just in: Free the humans! If you read my post yesterday, I ended with a call for ideas on how to ease towards and back into September and work mode….with more joy and less angst. Well, this just in: Two colleagues in the coaching world that I respect very much are starting a movement called “Free the Humans” — and kicking it off on Labour Day with a “Free the Humans” be-in picnic! 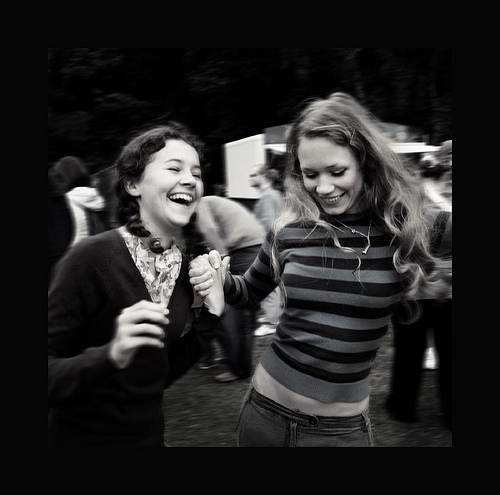 According to Darlene Russell and Charmaine Sherlock — the co-founders of this event and social movement — “the intent is to celebrate the 40th anniversary of the famous Summer of Love and to mark our reluctant return to work”. And if you’re not from the area…..stay tuned in because as Darlene said, this is about much more than a one day event: it’s a social movement and they inviting others to help co-create a new way of being at work. Gotta like the sound of that! Also worth noting, Darlene and Charmaine are also offering a fantabulous program for organizations wanting to perk up their people with their unique coffee breaks. If you’ve ever witnessed Darlene in action with her creativity, well, you’ll know you’re in for something special! It’s all on their blog – so check it out! To freeing the humans and a TGIM work life! Can you hear it? Smell it? Feel it? It’s undeniable. It’s September. And it’s making its way back into town. Nudging out the lightness of summer…and imposing a little bit of its heaviness…its urgency….the workloads…and with all the seriousness of that familiar and earnest “back to school/work’ mentality”. Arrghh. Already? I can’t tell you how many times I’ve heard (and said myself): “The summer is going by way too fast“. Notice how we never hear anyone say these things in February or March: “Winter is going way too fast….darn, before you know it will be spring”. August is like Sunday: I think the end of August is akin to what Sundays are to Mondays. They can bring a little bit of resistance in us. If there was a way to delay September (or Mondays), many of us would! That resistance seems to be a naturally ingrained habit. We automatically start to dig our heels in a bit deeper as we get ready to do the heavier lifting that comes with fall. But here’s the thing (if you’ve been reading my blog – you know there’s always a ‘thing’:): The worry and resistance — albeit may be a bit ‘automatic’ — is wasted energy and definitely not good for your ‘mojo’ (another word in my TGIM vocabulary….i.e your ‘joie de vivre). The worry and regret puts us in either the past or future…and we miss the present! And it takes away the lightness of being that can come with any season — with the right perspective. Fall is coming – nothing we can do about that. But we can do something about the perspective we hold in these last days of August. 1) First let’s give summer the farewell it deserves and celebrate it! You can do that literally (party anyone?) or mentally by reflecting on what you loved about your summer this time round. Distinction: This is not about dwelling…it’s about acknowledging. Too often we focus on what we didn’t get around to doing this summer…e.g. didn’t travel enough, take enough time off; etc. That mindset is filled with regret and definitely not good for your “mojo” and TGIM perspective. 2) Now make a list of what you have to look forward to in the fall. Focus on both your worklife and life in general in autumn. I did this and realized that despite my sadness that summer is over, I actually remembered how much I do love fall. It’s a great season. For instance, for those that live in four-season climates, we have the fall foliage; if you like fashion, you can’t deny that fall is the season for new clothes! A new TV/Movie season starts – and in Toronto, one of the world’s best filmfests ever. On the worklife front, I’m lucky in that I have projects and client work that I’m looking forward to. Yes, lots of work coming….but when I put it in this light…well, it’s much more enticing. How about you? What are you looking forward to in your worklife and ‘life’ in general? 3) Lifelong learners – take a course! It can be work related or anything. Last fall, I got back into my Second City courses. Back to school isn’t just for kids….T’is the season to learn something new just for you! 4) Pay attention and notice what happens as you create your list. I don’t know about you but I’ve been working on my list today and have noticed a marked difference in my energy. I’m now actually looking forward to September! I can almost taste it….and it’s okay! How about you? Any thoughts/ideas to share? In the week leading up to September it would be great to share some more tips and ideas. Bring ’em on! TGIM Worklife Blog — in Voice….hear this! Hey – just trying out a new little tech gizmo that allows me to show up in voice…along with a few images too. Not sure exactly yet how to link seamlessly into this blog so I’ll go the easy route for starters and invite you to listen in to this post archived in Photobucket. The 4 minute presentation is ideal if you are new to this blog….introduces you to the site. I’ll put up more (interesting) stuff once I master this thing….but for starters, if you want to meet me in voice…Turn up your speaker volume and Listen here . Stay tuned for more….real soon. In the meantime, have a super TGIM start to your week. Happy Monday! In my head that is…..ideas/thoughts/busyness/work/work/work……all converging and found myself a little stuck on what to blog about. Intellectually I have a ton of post ideas…..but the inspiration to actually write was nowhere to be found. Blank stare. Traffic jam of ideas – but nothing to say. Hmmm. In the spirit of ‘masterful noticing’ – I’m noticing that I might be needing a little break. My battery running on low juice. Thankfully, I’ve had plenty of energy left for my clients….in fact, have been very inspired, energized and engaged in my work. But at the end of the day, I’ve had enough. So….no blog posts last week. I figured no point in forcing it just to write something. Sometimes you just have to surrender. Suuurrrender……ahhhhh….I like that sound of that. Idling in traffic for just a bit and surrendering. In fact, it is in that very spirit that I booked a week off 3rd week in July to do………nothing, nada, or whatever. My only commitment for that week is to not commit. More time for surrender coming up. Sigh. Feels good just to think about it. But check back real soon cuz that urge just may happen again. I can feel it.